MTRCB has called the attention of ABS-CBN over 'Gandang Gabi Vice' or 'GGV' and 'It's Showtime', which both have Vice Ganda as the host or one of the hosts. Allegedly, MTRCB received complaints from the viewers against the 2 shows because of double-meaning jokes. Thought MTRCB didn't single out those particular episodes of the noontime show 'It's Showtime' containing double meaning scenes and words, but I think it came to their attention one particular episode wherein Vice jokingly said that he already saw Vhong Navarro's "espada" and it was like a "toothpick". 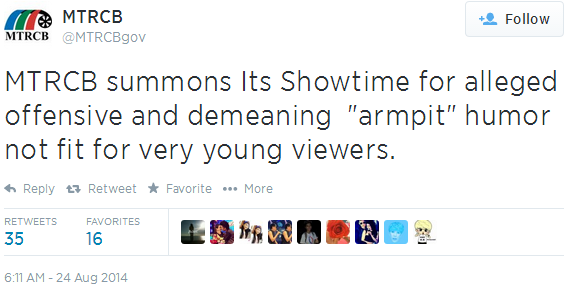 That definitely counts in as a double-meaning joke, but I actually don't get it why MTRCB has summoned It's Showtime because of "armpit" humor, as posted in its tweet last August 24. 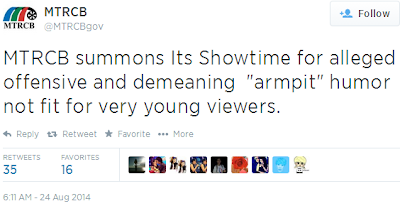 According to the tweet, it was alleged offensive and not fit for very young audiences. I'm not sure exactly which Showtime episode MTRCB was referring to, but I already caught Vice in some episodes making fun of Dumbo's armpit and even his own. But how can this be offensive to the kids? Did a child cry to his or her mom because he or she got horrified by Vice's "dark" armpit, or that of Dumbo? As for GGV, I also don't get it why it had to censor the show over those double-meaning jokes, when in fact it's airing on a late night timeslot already and most of the time, MTRCB has been giving it an SPG rating. What's the use of that SPG rating if the show still has to get away from those jokes?